Windows 7 has many good things going for it, but home networking is not always one of them. But with just two quick clicks within Win7’s Advanced sharing settings, you can improve your local network throughput by as much as 12%. Windows 7 is the best Windows I’ve ever used, and I’ve used them all since version 1.0. But, like all software, it’s not perfect. One of the oddest glitches I’ve encountered with Microsoft’s newest OS is erratic local-networking performance. Occasionally and for no obvious reason, a Win7 LAN connection will slow to a crawl — giving you that less-than-nostalgic feeling that you’ve gone back to a dial-up connection. The problem seems completely random; I’ve never been able to reliably reproduce it. But I’ve seen the problem enough to know it’s not some figment of my imagination. And even when everything’s operating normally, I’ve had a sneaking suspicion that my Win7 networking is running slower than it should. Trust me; I’m not alone in this belief. Do a quick search on the phrase win7 slow network and you’ll see what I mean. I’ve always suspected that the prime suspect in Win7’s sometimes-sluggish network speed is the OS’s HomeGroup feature, which is enabled by default. A homegroup is a kind of self-configuring workgroup that automatically sets up file- and device-sharing between Win7 machines on a local network. A homegroup is a godsend for people intimidated by networking. Although it’s easy to use, HomeGroup (like most black-box, self-configuring software) is a take-it-or-leave-it setup; you don’t know — and can’t change — which assumptions Microsoft built into the product. In that same vein, it’s designed to work under a wide range of circumstances — but not necessarily optimally for any of them. By default, Windows 7 also enables 128-bit encryption for home-network file-sharing (up from the 56-bit encryption used in earlier versions). But while heavy encryption might sound good, it does soak up some processing power and time. So I suspected that this extra encryption could also be a factor in Win7’s lackluster LAN throughput. But all of this was speculation — an educated guess. The only sure way to know was through testing. My concept for measuring LAN performance was simple. I’d time how long it took to copy a large set of files across the network under carefully controlled conditions. First, I would copy the files using Win7’s default settings (with HomeGroup and 128-bit encryption enabled); then I’d copy the same files again, using the classic workgroup networking settings (with HomeGroup disabled and standard 56-bit encryption). To create a sizable set of test files, I cloned my for-real Documents folder from the Win7 PC I use every day. That folder consisted of 2.59GB of data — an eclectic mix of 10,846 utterly standard files such as word processing documents, e-mails, text messages, spreadsheets, images, and .zip files (all representing a wide range of sizes). There were no weird or nonstandard files, no system or hidden files, nothing to make the network transfer either unusually hard or too easy. They were, in all likelihood, similar to those you have on your system. In the first set of tests, I copied the files between brand-new, freshly installed, unmodified Windows 7 installations. I then did the same tests using my real-life systems, including the Win7 PC I’m using to write this article. In both cases, I copied the files from the source PC to an empty folder on the target PC, thus avoiding any file-overwriting problems or delays. While running the tests, I also shut down all other devices on my office network, disconnected the router from the Internet, and killed or suspended all software that wasn’t needed to run the tests (ensuring that no other factor would influence the results). Once everything was set up, I used Win7’s little-known Robocopy command to move my cloned Document folder across the network. (Robocopy stands for “Robust File Copy”; see its TechNet info page for a thorough description of how it works.) Akin to Xcopy in earlier versions of Windows, Robocopy can clone entire folder trees, including subfolders many levels deep. Making it truly ideal for my tests, Robocopy also gathers statistics on its own operation — such as how long the copy took, how many files and bytes were moved, and what the overall throughput was in bytes per second and megabytes per minute. It’s a handy tool! Setting Win7 to use classic workgroup networking instead of HomeGroup (a painless, two-click change) resulted in an immediate increase in networking throughput. On my systems, those two clicks boosted throughput by an impressive 12%. And since making that change, I’ve never seen one of those slow-as-dialup moments again! It was no fluke, either: the results were repeatable from test to test and machine to machine. Win7’s default networking settings (and not some other variable) were indeed the key. The results demonstrate that you’ll get the highest speed boost simply by disabling Homegroup and using classic workgroup networking. You gain a second, more-modest boost by dropping 128-bit file-transfer encryption down to 56-bit encryption. More pleasing, however, was the elimination of the random slowed-to-a-crawl events after disabling HomeGroup and restoring 56-bit encryption. 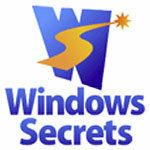 Windows Secrets fred langa, Microsoft Windows 7, networks, Windows 7, windows network, windows secrets. permalink. Thanks A Bunch.Before doing what you suggested it was a chore to go to any site.Wait,& Wait & Wait,……………..Etc.This is awsome.Thanks again. I’d never noticed if having the Homegroup active made any difference, but as with so many things, if it’s not needed, why let it hog resources?